Finding a SEO company can be hard work! The process of hiring a SEO vendor or consultant in a sea of spam and fake merits has to be exhausting and who has money to gamble with? The SEO industry as a whole doesn’t make it any easier by perpetuating a very real reputation management problem through pay-to-play “Best SEO Company” lists. This post is a word of warning with actionable steps on how to choose a SEO company that’s right for you and builds a long-term, trusting relationship. Within a few days of that situation, Jill Whalen was solicited for inclusion in a paid list of the “top search engine marketing firms” from the International Business Times. 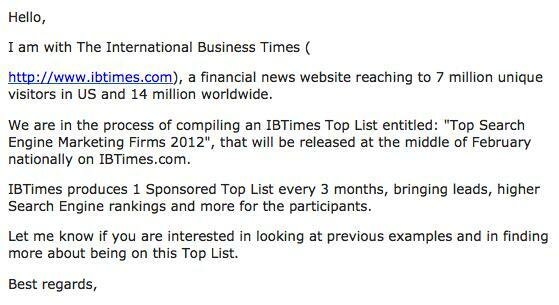 Here’s the email she received: The IBTimes list of top SEO companies was just published here. – at least $100,000 in revenue in 2008. I don’t think Inc.com’s list has a shady set of criteria–they’re looking for established, sizable SEO companies. That’s great, but I only saw a couple recognizable SEO firms on the list, which tells me most of the companies we respect aren’t listed (even though they meet the criteria) and highly qualified individual SEO consultants are excluded due to size restrictions. Not a single SEO agency appeared on more than one list and I’ve never head of most of them. Now, this doesn’t mean those firms don’t provide great service, but I’ve been in this industry for seven years and own my own SEO company in which we’ve done extensive competitive research. I have to think that if these are the best SEO companies, I would recognize more of them. What value do these lists provide when so many require paid inclusion or they are limited by the reach of their community and brand? The question remains–how to choose a SEO agency? First, ignore the “TOP SEO, OMG I’M AWESOME, BECAUSE I PAID FOR THIS AND BELONG TO THIS COMMUNITY!” lists. The same goes for the banners on their sites, because we know those help convert customers regardless of merit or criteria. I hate to point out the obvious, but sometimes, we’re really stupid when it comes to the Internet and there is a generational and digital divide that puts certain researchers at an immediate disadvantage. Check the site’s own rankings, community engagement, backlink count and domain authority, etc. For more guidance on how to choose a SEO company, Google also has warnings and questions to ask here. Rand Fishkin published some great tips on how to choose a vendor here. And, Stephan Spencer outlined the SEO RFP process here on Search Engine Land. Take advantage of the preliminary call to get a feel for the SEO company’s values and communication style. Does it work with yours? And, always be honest with the agency prior to their work on a proposal. E.g., don’t hide your budget/needs, because time may be wasted if that’s a deal-breaker on either side. In summary–SEO buyer beware. Do your due diligence when shopping around for an Internet marketing company and make sure the SEO you choose is going to be transparent about their methods and abilities. Happy shopping!